Swiss made Pégas Modified Geometry Scroll Saw Blades tooth design minimizes burning, tolerates aggressive feed rates, expels chips extremely fast. This leaves a smooth finish and cuts patterns accurately. These Blades can be used on soft and hard wood. It is also well suited for plastic. If you are currently using Olson PGT or Mach blades you will love our Modified Geometry blades. With a spiral scroll saw blade, the teeth are on 360° which allows sawing in each direction. 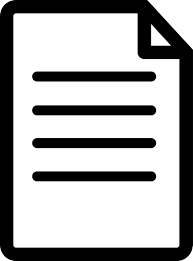 The work does not have to be turned to make cuts, so sharp inside corners can be created. This also allows working long pieces which couldn't be turned on a 16" or 21" scroll saw. Spiral Blades provide cutting around the entire periphery of the blade due to a helical shape. This design allows work to be fed in straight moves. Check out the Pegas Blades Selection Chart to learn about the possibilities for working with Hardwood, Softwood and Plywood with this selection of blades. Bear Woods is absolutely the O-N-L-Y choice for me when ordering my Pegas blades. I ordered the "Sample Pack" in order to give the Spiral blades a try, as I am already in love with the MGT blades. The price, customer service, and shipping simply cannot be beat. Bear Woods is definitely my "Go To" shop for all future Pegas orders...THANKS!!!! 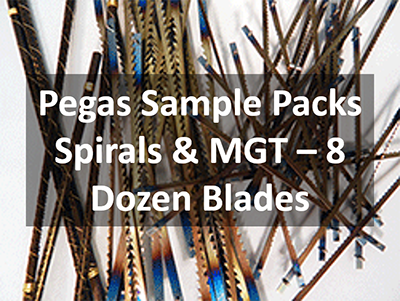 I have tried several blades Pegas blades from this sample pack which so far as performed better than any blades I have used previously. I definitely like these blades and will continue using they as my go to blades. They are my go to suplier. Same old story, you get what you pay for, and these are it. Very pleased with the product and the speed of delivery. Great saw blades, do a fine job.